In the wake of the breakdown of her relationship, Mhairi McPhail dismantles her life in New York and moves with her 9-year-old daughter, Agnes, to the remote Scottish island of Fascaray. Mhairi has been commissioned to write a biography of the late Bard of Fascaray, Grigor McWatt, a cantankerous poet with an international reputation. But who was Grigor McWatt? Details of his past – his tough childhood and his war years as a commando – are elusive, and there is evidence of a mysterious love affair which Mhairi is determined to investigate. As she struggles to adapt to her new life, and put her own troubled past behind her, Mhairi begins to unearth the astonishing secret history of the poet regarded by many as the custodian of Fascaray’s – and Scotland’s – soul. A dazzling, kaleidoscope of a novel, Hame layers extracts from Mhairi’s journal, Grigor’s letters and poems and his evocative writing about the island into a compelling narrative that explores identity, love and the universal quest for home. Annalena McAfee's new novel is published by Harvill Secker and Alfred A. Knopf. Annalena McAfee was born in London to a Scottish mother and a Glasgow-Irish father. She founded the Guardian Review, which she edited for six years, and was Arts and Literary Editor of the Financial Times. Her first novel, The Spoiler, was published in 2011. 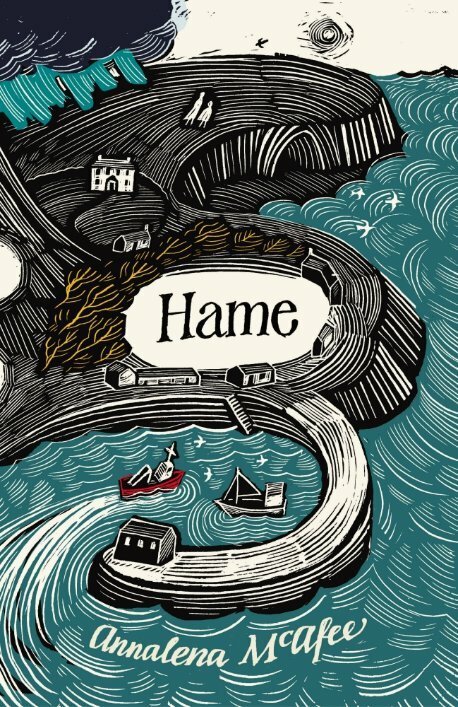 Her most recent novel is Hame (2017).